If you need an unusual groundcover that can tolerate the hot dry summer, try this low, spreading artemisia. This lovely groundcover sagebrush has a nice neat, dense form with aromatic gray green foliage. It's a great way to add texture, color contrast and fragrance in a drought-tolerant garden. Despite it's north coast origins we have found 'Montara' to thrive in hot inland conditions with almost no supplmental water. 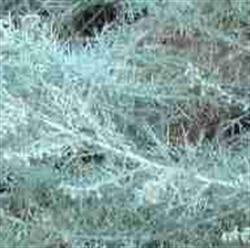 Some speculate that it is a natural hybrid between Artemisia calif. and Artemisia pycnocephala. This is fast becoming a landscaping favorite, but is not commercially grown in many nurseries and so is hard to find. 'Montara' was selected from a cutting at Montara Mountain by Roger Raiche and introduced by Wildwood nursery in 1987. I love this groundcover. Soft, inviting touching by little ones. Smells lovely.